For some in Poland the Cursed Soldiers are national heroes; for others they are murderers. Ghosts from the partisan past return to haunt a community in eastern Poland. For some in Poland the Cursed Soldiers are national heroes; for others they are murderers. A march in celebration of a group of Polish partisans fighting the Soviets has become the focus of tension in a small community in one of Europe’s oldest forests. Those taking part believe the partisans – known as the Cursed Soldiers – were national heroes, but others remember atrocities committed by them 70 years ago. Some partisans were responsible for the burning of villages and the murder of men, women and children in and around Poland’s Bialowieza forest. The people living the forest are Orthodox and Catholic, Belorussian and Polish; this march threatens to revive past divisions between them. Many believe that far-right groups have hijacked this piece of history to further their nationalist agenda. 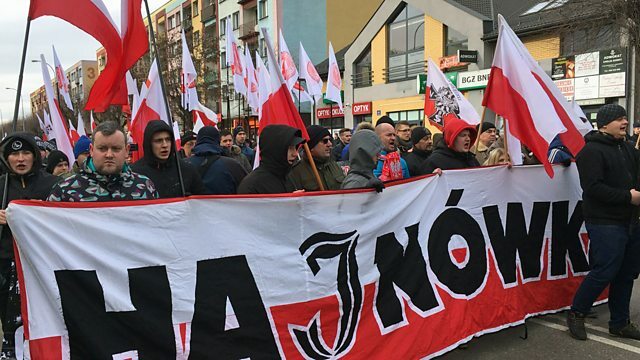 For Crossing Continents, Maria Margaronis visits the forest to find out why this is causing tensions now; why the locals feel the march is making them feel threatened; and how this reflects wider political rifts in Poland today.